In previous posts, I’ve mentioned my TB-03 synthesizer and TR-8 drum machine. While both offer analog audio input and output to chain the sound, it gets tricky when trying to record since there are multiple volume nobs essentially daisy-chained. Adding even more devices breaks down the whole setup. 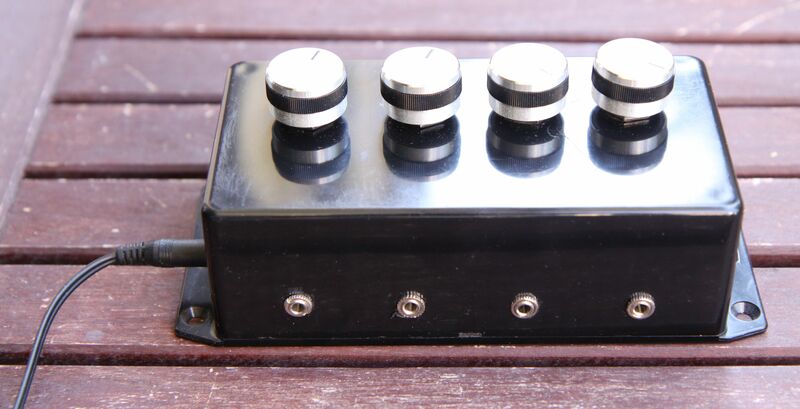 So I needed a simple audio mixer, and decided to put together something myself. The only requirement was to adjust the volume of the stereo out of each device, and mix it together into one signal. 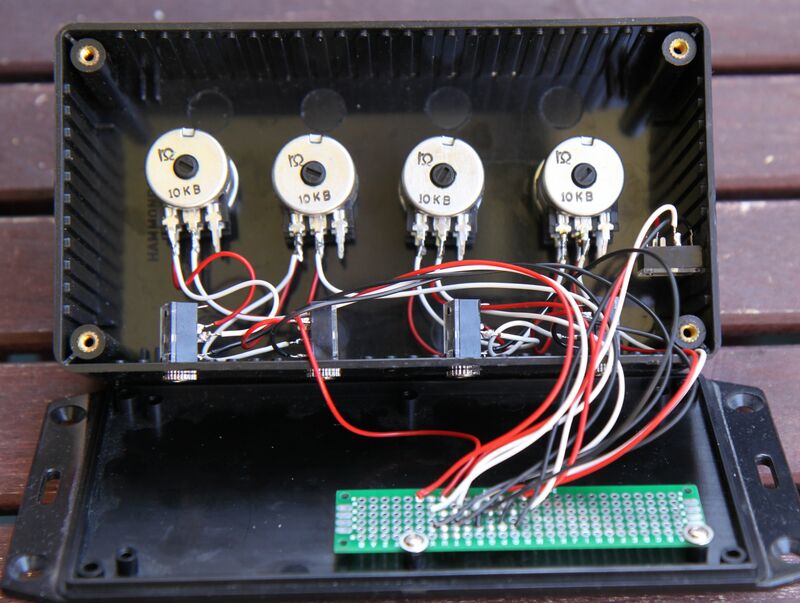 A simple solution adds a potentiometer on each input line (right and left), and combines each line down to one output. I used 10k ohm dual logarithmic rotary potentiometers (which I found at a local electronics shop – which means they’re probably quite old). The input and output connectors are all stereo mini-jack. As the pictures show, it’s a simple small box, with four inputs, four rotary knobs, and one output. I liked the knobs, however, had wished they could be flush with the surface of the box. They were not made for the potentiometers I got, and it took some Dremel work to make them fit at all. 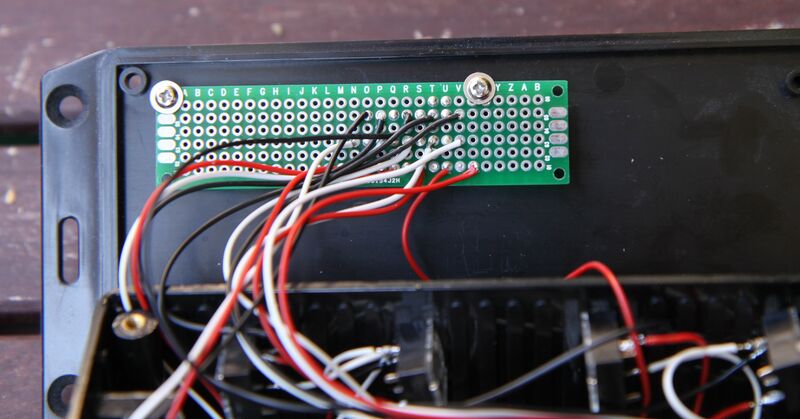 The wiring got a bit messy, and combined dual or even three wire would have made it look better on the inside. The mixer and volume adjustment work, however, I’m not sure if 10k ohm is enough to adjust the devices. It is not enough to mute the sound. This article suggest adding a 1k resistor in series, which I might try later. It would also be interesting to see at what resistance level the sound is completely muted. 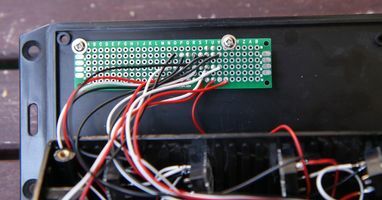 Other implementations connects the third pin of the potentiometer to ground from the input. In my box, all ground wires from all inputs and output are combined directly, which I’m not sure if is correct. 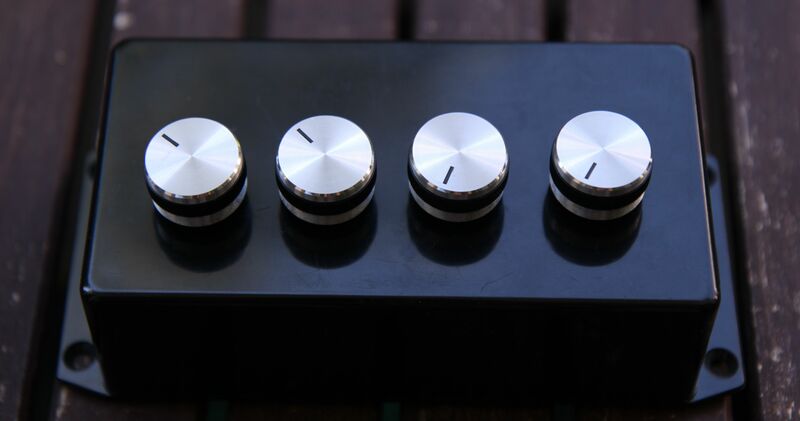 Oh, and as can be seen, there’s no scale to indicate the setting of each knob. These can all go to 11 if you like! 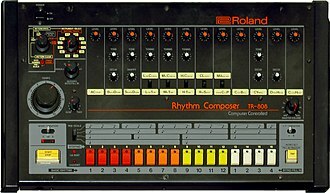 As a follow-up to the TR-8 post, here’s an interesting and entertaining documentary about the original drum machine TR-808. Featuring plenty of colorful characters, from Afrika Bambaataa with a knife as a hairpin to Goldie with his mouth full of gold, it’s a fun watch. There’s other famous artists as well, including Norman Cook (aka. Fatboy Slim); Phil Collins; Felix Da Housecat; Tiga; Armand Van Helden and many more. 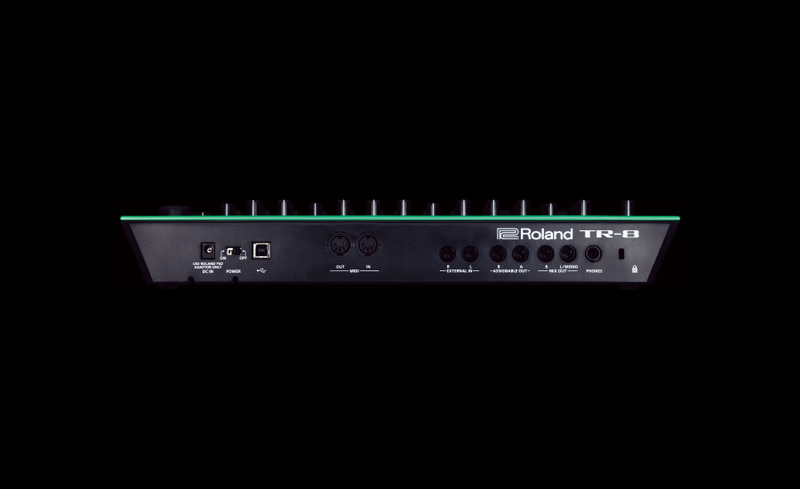 The Roland TR-8 drum machine is the prefect complement to the TB-03 synthesizer. 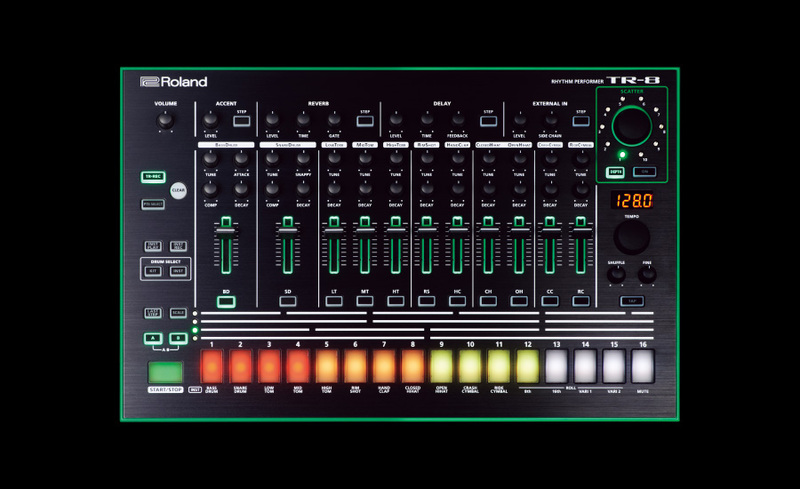 In the TR-8, you can find the old school beats of the TR-808 and TR-909, plus more. There’s a smooth heavy bass drum; a snare; toms; claps; hiats; and cymbals. The ride-cymbal in particular gives a nice spacey sound when used in combination with some delay, and perhaps one of the scatter effects. 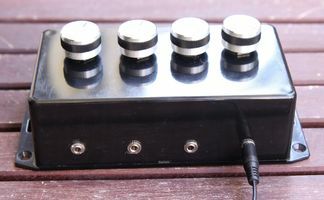 There are multiple input and output options, including analog connectors, MIDI and USB. 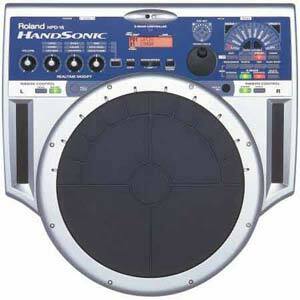 The TR-8 syncs fine over MIDI with the TR-03, as slave or master. However, I was surprised to find that connecting the USB to an old computer did not go so well; it somehow interferes with the clock, so notes are skipping, even when nothing is connecting to MIDI nor audio on the computer. Roland has a somewhat cheesy tutorial here, while this guys talks about the “hidden” features in the “boot mode”. Finally, my own MIDI monitor is starting to come along, and can now understand both TB-03 and TR-8 messages, including all special controllers. The PatternHistory is already useful to see which notes and patterns are playing. So far only one instrument at a time is supported, but more is coming. 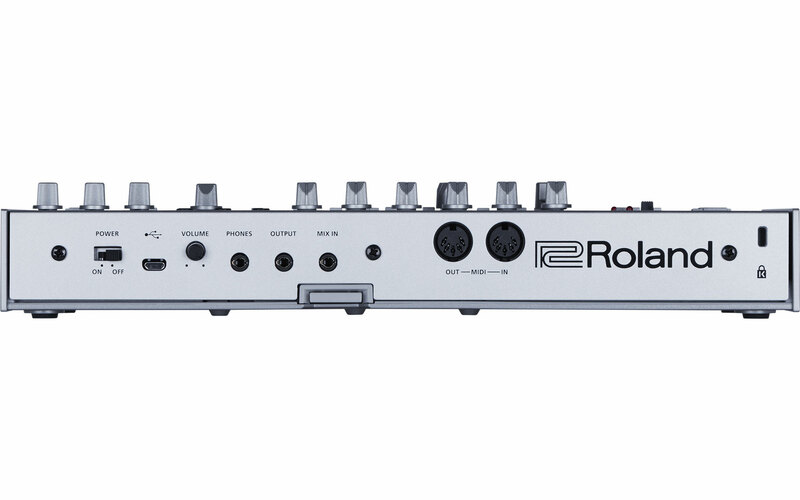 The Roland TB-03 is a remake of the famous TB-303 bass synthesizer which defined acid techno since the late 1980s. 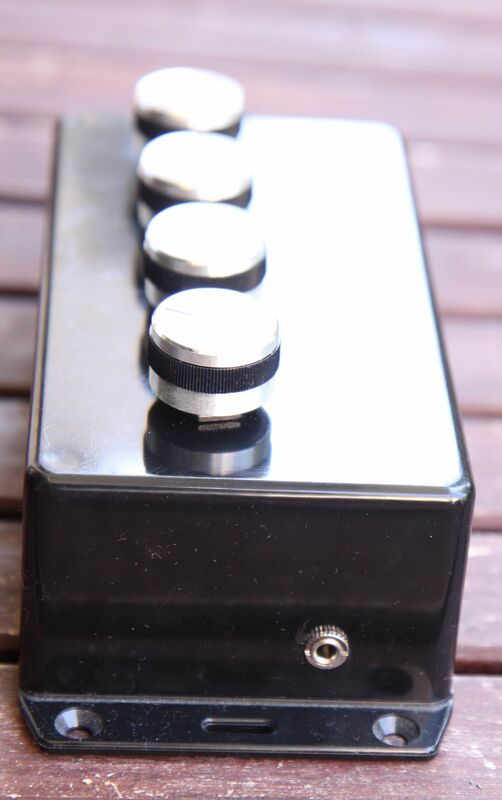 The TB-03 recreates the squeaks and high pitches of original. The button and knob layout is mostly the same as the original, but with a few extra features: A four digit LCD display is added, which makes it easer to keep track of programmed patterns and tempo. Another modern feature is the micro USB port, which exposes a 24-bit/96kHz audio interface and MIDI. It can be powered by USB or 4 AA batteries. I was lucky to be gifted one for Christmas, so have had only little time to try things out. So far I’ve gone through the brief but instructive videos from Roland’s own Youtube channel listed below; plugged it in over USB and seen the MIDI messages in midisnoop (packaged in both Debian and Ubuntu); and programmed a snippet inspired by Josh Wink’s “Higher State Of Consciousness”. Also useful, this trick to copy patterns, using the Original 303 Mode. Danny Kelly says good riddance to HMV because it was sickly for some years before it died. I suggest however that the fact it took time to die does not make its loss (and that of its high street competitors) any less regrettable. What replaced them is a disaster for freedom. I miss stores like HMV because I could go there with cash, buy records (usually CDs), and take them home as mine. These large stores had a wide range of music, and I could listen to records in-store (mostly music I had never heard of) to find what I liked. Once I had bought the records, I was free to give or lend them to friends. Under copyright law, I could even copy them, to audio tapes in the old days, and give those to my friends. All this without the state’s knowing anything about it. You can’t buy music that way on the internet. You are forced to identify yourself to the seller (and to Big Brother, watching over his shoulder) — and if it’s not a CD, you have to sign a restrictive contract which denies you the rights we all enjoyed. I say “you” because I won’t go there. For those who love both music and freedom, today’s form of internet sales is out of the question, which leaves ever fewer opportunities for us to buy music. Aside from disks sold by musicians, and a few surviving large record stores such as Amoeba in San Francisco, the only way a self-respecting person should get copies of music is through digital sharing. The superficial convenience of internet music sales is the bait; in the UK, the Digital Economy Act is the jaws. And HMV was the safe and ethical road to music, which a society focused on the short term has not kept open. Enjoying a concert by Jean Michel Jarre recently, I got musing over his many innovative and experimental ways of controlling the music. 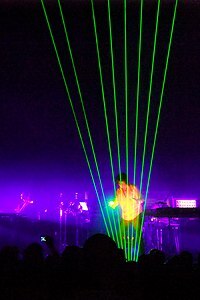 Including signature instruments like the laser harp, theremin, but also more conventional boxes, like the Minimoog and various Moog synthesisers, the ARP 2600, the Moog Liberation keytar synthesizer, Korg Mini Pops, and Roland HPD-15 Handsonic Percussion Controller, an iPad, and much more. For even more experimental instruments, see the Elixir and Home Made Labor acts. They make they own instruments, sample it, tweak it, and create ambient sound-scapes. At a live performance a few years ago, they would mould and shape the sound as they went along, slowly adding complexity ad-hoc. Here’s a video where they go into a bit of detail. Finally, while digging up some of this, I came across to other Zurich based projects: domizil, and ICST. I don’t know much about either, but domizil has a few CDs out. Might be worth looking into. Simple is beautiful! Who needs fragile BPM software when you can do the counting yourself!? Here’s two online BPM (beats per minute) counters where you hit a key for each beat. The form will give you the average BPM. This also comes with a “tempo calculator” if you hit Submit. hblok.net 2017. "Life is Simple" is a simple theme for WordPress, powered by Chereshka.